We were given a room upgraded upon arrival (woohoo!) by the very friendly and helpful staff. The room was clean and very comfortable. Will definitely return. A good experience Very happy with the facility overall, friendly helpful staffs, good location, nice room. Very nice appartments. Our only issue was limited amount of hot water for a family (only happened once). 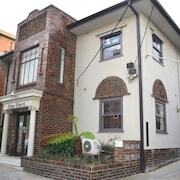 Staff were very friendly and rooms were clean and well appointed. Over night stay Absolutely amazing ! Great location, frony desk people are so welcoming. Would recommend staying here And also a 5 min drive to chapel street also. The room we stayed at didn’t look like the photos. Great reception staff. Nice room ina convenient location to St Kilda. Always a Treat This was my third visit to The Prince and I must say that I absolutely love staying here whenever I visit Melbourne for work or play. Comfortable beds, beautiful restaurants and cocktails areas, fantastic location. Outstanding on all fronts. If you've ever looked at your friends' social media and thought your life was a bit vanilla, get your own back with a stay in St Kilda. Situated 6 kilometres from the centre of Melbourne, it's a fantastic place to base yourself while exploring Victoria's capital. Start making epic memories (and taking some brag-worthy selfies) at the Crown Casino and Entertainment Complex, Federation Square and St. Kilda Beach, just some of Melbourne's famed attractions. While you're roaming the area around St Kilda, be sure to check out Luna Park. This worthwhile attraction ought to be on your itinerary. Too stuffed to travel miles away? On the lookout for a hotel near St. Kilda Beach? Easy. Check out the Quest Prahran, Quest Windsor, Art Series - The Cullen, Prahran Village Guest House and Novotel Melbourne St Kilda. You won't have to drive for ages to reach Luna Park. 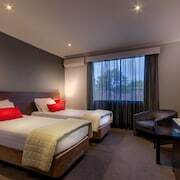 Stay nearby at the Melbourne Parkview Hotel, Quest St Kilda Bayside, Pullman Melbourne Albert Park, St Kilda Junction Accommodation and The Prince and save your time for the fun stuff. Travellers and locals alike love taking a break in Lumley Gardens. At the end of a busy day, rest your head at a comfy hotel close by. 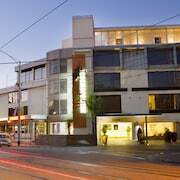 The Lyall Hotel and Spa and Amity South Yarra Apartments are two awesome options. History buffs will love Rippon Lea House and Gardens. Jump on a tour, wander through these historic rooms and learn about the local history. Need somewhere to rest your head close to here? 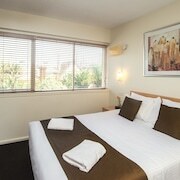 The Rydges St Kilda and Adina Apartment Hotel St Kilda Melbourne are popular with many visitors. Everyone has holiday horror stories about receptionists from hell and creepy-crawly infestations. But trust us, cheap doesn't have to mean nasty. There are heaps of bargain hotels available here, and at the top of our list are the Habitat HQ - Hostel and Base Backpackers Melbourne Hostel. What else are holidays for if not splashing out? The Sixty Two on Grey and Cosmopolitan Hotel are lastminute.com.au's recommended picks for those travellers who aren't frightened of spending a little extra cash. Evening go a bit too well? After a caffeine hit? Easy. Just follow the heavenly scent of roasting coffee beans to Galleon Cafe. Luckily, it's not far away, so your aching head won't have to wait too long! An early night is possibly in order, but if you need a hearty meal beforehand, Pablo Honey Tapas Bar has a fabulous menu. If you and your mates are having a hard time finding the right St Kilda hotel, have a gander at our Fitzroy Street hotels guide. 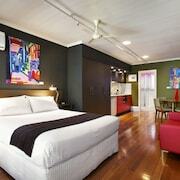 Alternatively, our lastminute.com.au Elwood hotels guide will sort you out. So, what else do you need to know? Whether you're seeking a long weekend away with bae or a nonstop spiritual adventure, we're here to turn your dreams into reality.